Blogadda Who are you reading today? remarkable memory, I didn't really forget the plot and the characters but when I watched it yesterday I realised that my reaction to the film had undergone quite some change. 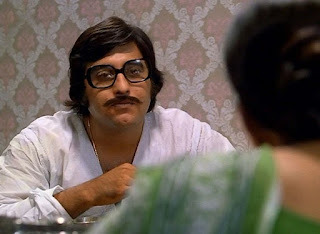 The first viewing was accompanied by my father's incessant appreciation of Utpal Dutt, who plays a unique role in the film. With his commentary I ended up believing that it is a perfect suspense thriller with able performances not only by Dutt but also by the protagonists Vinod Khanna and Shabana Azmi. Understandably this teenager's impression was a tad coloured. Meena Joshi receives an curious letter from some Maan Singh, while her husband, Vinod Joshi is away for work. The letter alleges that Vinod had murdered Kale after stealing money from his office and put the blame on the innocent Subramanium. The author also alleges that the Joshis' sudden rise to riches was because of that stolen money and that Vinod is actually a scheming fellow who has planned the misdeed. Meena's halcyon world comes crashing down. While she refuses to believe what the letter says, she keeps questioning Vinod's sudden contact with so much money. Eventually Vinod finds out that Meena is suspecting him and though he tells her that he earned all the property through his dealings in the share market, Meena takes it all in with a pinch of salt. With the lack of faith and trust, a wall develops between the couple and their marital bliss is affected. They try to keep up a happy front before their son, Mithu who is visiting them from boarding school but inside the bedroom it's a difficult scenario for the duo. The rest of the film unravels the truth behind this conumdrum of theft and murder, with some masala thrown in. conveying such difficult emotions. For instance, when he rebukes his wife for mistrusting him, there is hardly any pathos in his voice. He is just grouchy and over-dramatic. Shabana Azmi could have done a much better job. She keeps whimpering. For the woman who strode like a lioness in films like Mandi, Arth and Masoom, I feel she could have approached the role in a much more nuanced way. There are the occasional sparks where she ponders over the problem but that's about it. She hardly has any good lines to deliver, too. But saying that, the film does have some fine characters and performances. Like Farida Jalal, who plays Mrs Subramanium, wife of the convicted. It's a tiny guest appearance but it packs a punch. Frustrated, disillusioned and defeated this woman is struggling against odds to bring up her children. There is no money to send them to school. Her tongue is harsh out of embitterment and she rightfully subs Meena when the later comes to visit her to check the reality. Meena in a guilty rush send a few banknotes to this unfortunate woman but Mrs Subramanium has more self-respect than either of the Joshis can ever imagine. In Black & White » Uden jab jab zulfein teri! No text or photographs may be reproduced without permission of the author of this blog. In case any material is cited or reproduced with due permission, it should carry appropriate attribution.